When the going gets tough it’s vital that advice is obtained as soon as possible. The earlier we’re brought in the better the prospect of finding a solution that will allow the business to survive; rescuing a business is always our first objective. We start by making sure that we understand the reasons for the difficulties and seeking to address them. We’ll work with you to manage your cash flow and working capital, and to deal with the needs of key stakeholders such as bankers and major creditors. Then we’ll work with you to identify and address the causes of under-performance and develop a strategy to restore stability to the business and bring about improvement. If necessary we can use formal procedures such as administration or a company voluntary arrangement to provide protection from creditors and negotiate legally binding compromises. 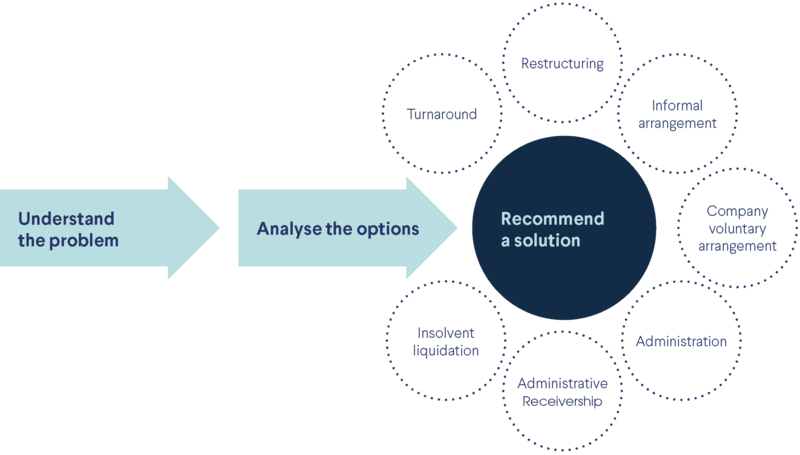 Even where the financial problems are insuperable and recovery is not viable, we’ll find the most suitable solution which provides the best outcome for all concerned, maximising the outcome for creditors and minimising the exposure of guarantors. In some circumstances it may even be possible for the existing management to be involved in the business in the future. Our team has vast experience, with a successful track record of handling assignments, from the smallest to the largest, from the straightforward to the most complex, and across a wide range of industries and sectors.